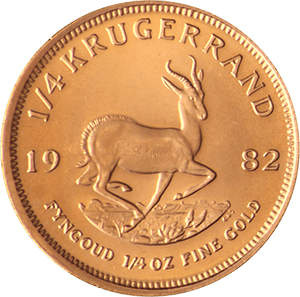 The Krugerrand was first minted in 1967 and by 1980 it accounted for over 90% of the worlds gold coin market. Over 50 million Krugerrands have been sold since production started. 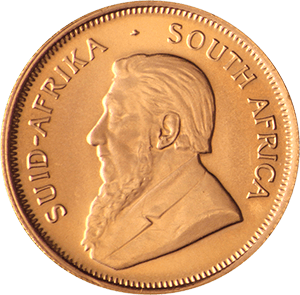 The 1/4 Krugerrand is the second smallest sized Krugerrand of the standard issues of the coin. It is particularly popular with newer investors as it is both affordable and sustainable for those with small budgets or who are tentatively looking to invest in precious metals or gold bullion in particular. The Krugerrand itself became such a popular investment in the latter half of the 20th century that it made up more than 90% of all gold bullion globally. Such was the coin’s success that it inspired other governments to invest in similar products, most notably increasing production in the Canadian Maple Leaf, UK Britannia, Australian Nugget, Chinese Gold Panda and American Gold Eagle. The 1/4 oz Krugerrand coin is of high purity, 22 carats, and has a diameter of 22.06mm. The gold content is 0.25oz and the entire coin weighs 8.513g. Some of the more sinister developments after the Krugerrand’s success was the increase in counterfeit coins and low purity products that were not minted by the South African government. Private mints, in a bid to cash in on the coin’s success, also designed purposely similar coins to the Krugerrand, with the former South African Prime Minister depicted on the obverse just like the official coin, to deceive investors. Broadly speaking, government minted coins are considered the most reliable, particularly if they are from trusted mints, such as the South African version. Due to these inferior “Fake” products, however, it remains vital that any gold bullion is purchased from a respected and trustworthy source. Goldinvestments.co.uk is one of the oldest vendors in the UK, and as such, we offer peace of mind for all our customers. Unlike most online traders, we have a physical office in London, from which we are happy to dispense expert advice about any potential investment in 1/4 oz Krugerrands or other precious metal products.